The EZ-Series offers a wide range of stand-alone designs including distribution amplifiers for line level audio, headphones, composite and XGA/XGA video, audio pre-power and mixer amplifiers, AV input selectors and computer video selectors. All models may be connected and operated without the use of tools, using standard cables. They are housed in enclosures with the same height, with widths in increments of one sixth of a rack-width, so they may be mounted singly or in multiples in a range of accessory mounts. Audio and video are switched using solid-state circuitry to avoid degradation due to dirty switches; critical connectors are gold-plated for reliable connections. All use 24 volt power, supplied from external AC adapters. Commonly used with record-replay machines such as CD recorders which have semi-professional audio input and output arrangements, typically using RCA (phono) connections, to interface them to professional, balanced, line-level systems, these are stereo units. They are bi-directional; they can interface both inputs and outputs of the recorder. Level indication and level control of both incoming and outgoing audio is provided. A range of mounting accessories is available for the Radio Design Labs EZ-series. The front panel has two pairs of RCA (phono) sockets for connection to the stereo inputs and stereo outputs of the unbalanced equipment. Each pair has a rotary gain control and four LED indicators to show normal and peak audio level for each channel. An LED indicates the presence of power. The rear panel has two female and two male 3-pole XLR connectors for connection of the stereo inputs and stereo outputs of the balanced equipment. A locking co-axial connector provides the power input. Unbalanced inputs: -10dBV nominal, +16dBV maximum, 10 kohms. Level control: Off to 12dB gain. Response: 10Hz-50kHz +\- 0.01dB. Distortion: Better than 0.01% THD+N. Noise: -85dB referred to +4dBu output. Crosstalk: Less than 75dB, 1kHz. Balanced outputs: +4dBu nominal, +26dBu maximum. Balanced inputs: +4dBu nominal, +26dBu maximum. CMRR: Better than 50dB, 50-120Hz. Level control: Off to 12dB gain. Response: 10Hz to 50kHz +\- 0.01dB). Distortion: Better than 0.003% THD+N. Noise: -75dB referred to +4dBu output. Crosstalk: Less than 80dB, 1kHz. Output: -10dBV nominal, +17dBV maximum. Power source: 24V DC, 45mA idle, 90mA maximum. Dimensions: 146 x 76mm (w x d). Mounting size: 1/3 rack width. Included accessories: AC power adapter with UK AC supply contact-pin assembly are included (see Optional Accessories for EU power adapter version). These units are for use where a single stereo unbalanced signal must be fed to up to four different pieces of equipment. Connectors are RCA (phono), gain control and level indication is provided. A range of mounting accessories is available for the Radio Design Labs EZ-series. This has one stereo input and four stereo outputs. The inputs are unbalanced, connected by both a pair of RCA (phono) sockets and a single 3.5mm jack socket on the rear panel. The outputs are unbalanced, on four pairs of RCA (phono) sockets, also on the rear panel. A locking co-axial connector provides the power inlet. The front panel has a gain control and a pair of 'normal' and 'peak' level indication LEDs for each channel. Power is indicated by a single LED. Inputs: -10dBV nominal, +22dBV maximum, 10 kohms. Gain: Off to +12dB. Outputs: -10dBV nominal, +16dBV maximum. Response: 10Hz - 20kHz +/-0.01dB. Distortion: 0.03% THD+N. Crosstalk: -80dB, 1kHz. Noise: -85 dB below -10 dBV output. Power source: 24V DC, 20mA idle, 60mA maximum. Dimensions: 146 x 76mm (w x d). Mounting size: 1/3 rack width. Converting a single stereo signal to multiple headphone sockets, these compact designs have a gain control for each output. Designs are offered with four or six stereo outputs, with a variety of input and output connectors. A range of mounting accessories is available for the Radio Design Labs EZ-series. This has, on the front panel, four rotary volume controls, each with a 3.5mm stereo jack for the headphone output, and a power LED. The rear has a locking co-axial connector for the power inlet and three stereo input connections comprising a pair of RCA (phono) sockets, a 3.5mm stereo jack and a 6.35mm stereo jack. Only one stereo input should be connected at any one time. Inputs: -10dBV nominal, +8.5 dBV maximum for RCA (phono) and 6.35mm jack; -16dBV nominal, +2 dBV maximum for 3.5mm jack, 10 kohms. Level control: Off to +2.5 dB gain for RCA (phono) and 6.35mm jack inputs, 100 ohm load; off to +9dB gain for 3.5mm jack, 100 ohms load. Outputs: 60 mW, 100 ohms load. Response: 20Hz-50kHz +/1.5 dB. Distortion: 0.1% THD+N, 10mW output, 100 ohms load. Crosstalk: -75 dB, 1kHz. Noise: -95 dB below 10mW output, 100 ohms load, maximum gain. Power source: 24V DC, 40mA idle, 65mA maximum. Dimensions: 146 x 76mm (w x d). Mounting size: 1/3 rack width. Similar to the EZ-HDA4A, this has the four headphone outlet jacks on the rear panel instead of the front. Specifications and accessories are as the EZ-HDA4A. This has six rotary volume controls and a power LED on the front panel. The rear panel has a pair of RCA (phono) sockets, a 3.5mm stereo jack and a 6.35mm jack for the stereo input; only one to be used at any one time. The 6.35mm jack has an associated loop output. Six 6.35mm stereo jacks provide the headphone outlets, again on the rear panel. Specifications and accessories are as the EZ-HDA4A except the following. Power source: 24V DC, 50mA idle, 80mA maximum. The EZ-Series HK modules are designed to eliminate hum due to ground loops between source and output. The front panel has the input connectors; either the two RCA (phono) sockets or the 3.5mm stereo jack socket may be used at one time, not both. The output connectors are on the rear. Again, either the two RCA (phono) sockets or the 3.5mm stereo jack socket may be used at one time. The shield connection of each input socket is electrically isolated from the case and from the output ground. A ground-lift switch disconnects the ground connection of each output socket from the case ground. Inputs: -10dBV nominal, 10k ohms. Gain: 0dB, nominal. Response: 20Hz - 20kHz +/- 1dB. Distortion: 0.05% THD, 1kHz. Crosstalk: -75dB, 20Hz - 10kHz; -65dB, 10kHz - 20kHz. Outputs: -10dBV nominal, 10k ohms. Dimensions: 74 x 76mm (w x h). Mounting size: 1/6 rack width. The front panel has the input connector, an RCA (phono) socket. The output connector is on the rear, again an RCA (phono) socket. The shield connection of each input socket is electrically isolated from the case and from the output ground. A ground-lift switch disconnects the ground connection of each output socket from the case ground. Inside there is a video isolation transformer for use with standard 75 ohm composite video. This is similar to the EZ-HK2, but with additional connectors for stereo audio and, internally, an audio isolation transformer. The front panel has three RCA (phono) input sockets, two for audio, one for video. The rear has a similar compliment of connectors and a ground-lift switch. Video performance: As the EZ-HK2. Audio inputs:-10dBV nominal, 10k ohms. Gain: 0dB, nominal. Response: 20Hz - 20kHz +/- 1dB. Distortion: 0.05% THD, 1kHz. Crosstalk, audio to audio: -75dB, 20Hz - 10kHz; -65dB, 10kHz - 20kHz. Crosstalk, video to audio: -80dB below -10dBV. Crosstalk, audio to video: -85 dB below 1Vp-p. Outputs: -10dBV nominal, 10k ohms. Dimensions: 74 x 76mm (w x h). Mounting size: 1/6 rack width. These compact switchers allow the user to select one of four stereo, unbalanced, line-level audio sources to a single stereo output using solid-state switching to avoid distortion due to dirty switch contacts. A gain control is provides which may be used to adjust the output level. Models are offered with and without a headphone amplifier, which is fed by the same selector switches. A range of mounting accessories is available for the Radio Design Labs EZ-series. This is similar to the EZ-HSX4; the front panel is the same except that there are no headphone sockets. The rear panel is also similar to the EZ-HSX4, except that there is no switch to select whether the output is fixed or adjustable; the output is permanently controlled by the level control on the front panel. Inputs: -10dBV nominal, +10dBV maximum, 10 kohms. Level control: Off to +12dB gain. Response: 10Hz-20kHz +\-0.05 dB. Distortion: Better than 0.03% THD+N. Noise: -80dB referred to -10dBV. Crosstalk: -70dB, 1 kHz. Outputs: -10dBV nominal, +17dBV maximum. Power source: 24V DC, 30mA idle, 60mA maximum. Dimensions: 146 x 76mm (w x d). Mounting size: 1/3 rack width. The front panel has four switches to select the input source and a rotary control to adjust the output level. Both 6.35mm and 3.5mm stereo jack sockets are provided for the headphone output, which follows the level set by the rotary control. An LED shows the presence of power. The rear has four pairs of RCA (phono) sockets for the four stereo line inputs and a further pair of similar sockets for the line outputs. A switch selects whether the output will be fixed, so the level control on the front panel only controls the headphone output, or adjustable, in which case the level control adjusts the level of both. A locking co-axial connector provides the power input. Inputs: -10dBV nominal, +10dBV maximum, 10 kohms. Level control: Off to +12dB gain. Response: 10Hz-20kHz +\-0.05 dB, line output; +\- 1.25dB, headphone output, 100 ohms load. Distortion: Better than 0.03% THD+N, line output; 0.1% THD+N, headphone output, 10 mW, 100 ohms load. Noise: -100dB referred to 10mW output, 100 ohms load, headphone output; -80dB referred to -10dBV, unity gain, variable output; -95dB referred to -10dBV, fixed output. Crosstalk: -70dB, 1 kHz. Outputs: -10dBV nominal, +10dBV maximum, fixed output; +17dBV maximum, variable output; 35mW, 100ohms load, headphone output. Power source: 24V DC, 40mA idle, 50mA maximum. Dimensions: 146 x 76mm (w x d). Mounting size: 1/3 rack width. The front panel has four push buttons to select one of the four sources. An LED indicates when power is present. The rear panel has four pairs of RCA (phono) sockets for the connection of the audio sources, and pair of similar sockets for the audio outputs. 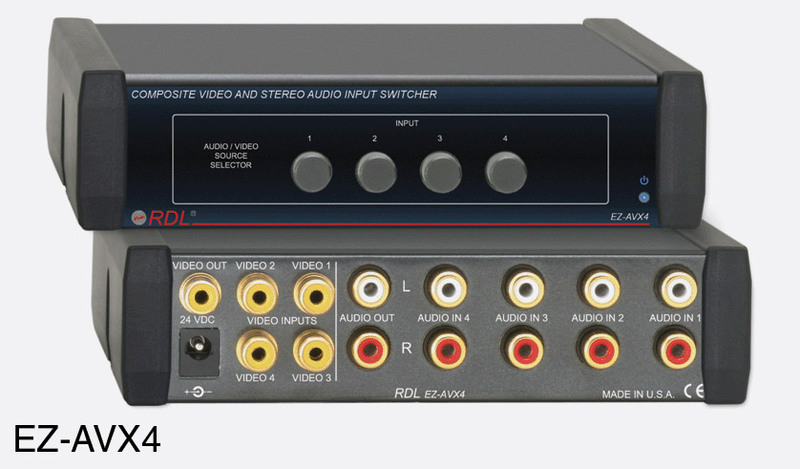 There are five further RCA (phono) sockets for the four composite video inputs and the selected video output. A locking co-axial connector provides the power input. Audio Inputs: -10dBV nominal, +10dBV maximum, 10 kohms. Response: 10Hz-20kHz +\-0.01 dB. Distortion: Better than 0.02% THD+N. Noise: -80dB referred to -10dBV. Outputs: -10dBV nominal, +10dBV maximum. Video inputs: 1Vp-p, 75 ohms. Bandwidth: Greater than 350 MHz. Differential gain: 0.1%. Differential phase: 0.1%. Off attenuation: Better than 40dB, 10M Hz. Noise: -90 dB, referred to 1Vp-p video, 75 ohms. Output: 1Vp-p, 75 ohms. Power source: 24V DC, 85mA idle, 100mA maximum. Dimensions: 146 x 127mm (w x d). Mounting size: 1/3 rack width. This is a computer video source selector and distribution amplifier with two inputs. It is aimed at AV applications in such environments as conference rooms, restaurants and clubs where it is necessary to feed more than one computer monitor or projector from a choice of two computers. The front panel has an LED to indicate power, two 15-pin HD D-sub connectors for the two inputs each with a switch offering a choice of connecting the local monitor and input ID bits, or not. A 'Sync' switch offers a choice between standard TTL or RGBHV 75 ohm video. A third switch selects which input is fed to the outputs. On the rear, power is connected through a locking co-axial connector. Two 15-pin, HD D-sub connectors offer separately buffered outputs for the local monitor and the second monitor or projector. Two trimmers set the equalisation and gain for the second monitor output. Inputs: VGA to QXGA RGBHV or RGB with combined sync. Gain: 0dB, local monitor output; 0 to +6dB other output). Equalization (peaking): 0 to +8dB at 50MHz. Video bandwidth: Greater than 470 MHz. Output offset: +\- 5mV typical, 75 ohm load. Sync (HV) input: TTL, 500 ohms or video, 0.7V to 5V p-p, 75 ohms. Sync (HV) output: 5V TTL. Sync (HV) propagation delay: Less than 4nS typical. Sync (HV) rise time: Less than 4nS typical. Sync (combined): Output follows input. Power source: 24V DC, 70mA idle, 80mA maximum. Dimensions: 146 x 127mm (w x d). Mounting size: 1/3 rack width. Included accessories: HD D-sub input cable, 914mm. AC power adapter with UK AC supply contact-pin assembly are included (see Optional Accessories for EU power adapter version). This is similar to the EZ-VM22E, but with four 15-pin, HD D-sub connectors offering separately buffered outputs. Two trimmers set the equalisation and gain for the second, third and fourth monitor outputs. Specifications and accessories are the same as the EZ-VM22E, except as follows. Power source: 24V DC, 70mA idle, 90mA maximum. Intended to produce consistent audio levels despite wide variations in the microphone output due to inconsistent technique, the EZ-MCP1 is installed between a dynamic or condenser microphone and a microphone-level input to a mixer or amplifier. This improves sound quality and intelligibility by producing consistent audio levels and controlling overloads that produce distortion and clipping in applications including, paging and public address in houses of worship, restaurants, clubs, meeting rooms, educational facilities, conference rooms and commercial sound systems. Input: -60 to -30 dBu (to cross threshold), 1 kohms, balanced. Input balance: 55 dB CMRR, 50 Hz to 120 Hz. Compression: 30dB. Response: 50Hz to 20kHz +/- 0.5 dB. Distortion: 0.5% THD+N, 50Hz to 20kHz, at compressor threshold. Noise:-63 dB below -45dBu output level at compressor threshold, -56dBu input. Output: -55 dBu to -30 dBu, 150ohms, balanced. Phantom power: 24V (IEC 1938: 1996-12). Power source: 24V DC, 55mA idle, 70mA maximum, with phantom power. Dimensions: 74 x 76mm (w x d) mm. Mounting size: 1/6 rack width. A range of EZ-series pre-amplifiers to allow the user to use a more substantial input level before the amplification or mixing stage of the chain. This has, on the front panel, a rotary level control, a switch to enable the compressor, LEDs to show normal and peak audio levels and a LED for power. The rear panel has an 3-pin female XLR for the balanced microphone input, a switch to enable the 24V phantom power, and a pair of RCA (phono) connectors as well as a 3.5mm stereo jack for the outputs. Power is connected with a locking co-axial connector. Input: -11dBu maximum, 1.2 kohms. Level control: Off to 50dB gain. Outputs: -10dBV nominal, +16dBV maximum without compression; -4dBV maximum with 20dB compression. Response: 80Hz-40kHz +/-1 dB, -6 dB at 20Hz with integral high-pass filter. Distortion: Less than 0.1% THD+N, 35Hz-20kHz, -50 dBu input. Noise: Better than 65 dB below -10dBV output, -50dBu input. Compression: 20dB range. CMRR: Better than 55dB, 20Hz-20kHz. Phantom power: 24V to IEC 1938: 1996-12. Power source: 24V DC, 55mA idle, 80mA maximum, 100mA maximum with phantom power. Dimensions: 146 x 76mm (w x d). Mounting size: 1/3 rack width. Similar to the EZ-MPA1, this has, in addition, a second rotary level control and a second pair of audio present LEDs on the front panel. The rear panel has a second 3-pin female XLR for the second microphone input. Specifications and accessories are the same as the EZ-MPA1 except the following: Crosstalk: Below noise floor, 1 kHz. Power source: 24V DC, 65mA idle, 90mA maximum, 110mA maximum with phantom power. Intended to interface a record turntable and magnetic pick-up cartridge to mixers and amplifiers with line inputs or to connect directly to recorders for dubbing records to other media, this is a stereo device with level adjustment and indication. The front panel has two trimmers to adjust the gain of the two channels and two pairs of LED indicators. These show when 'normal' audio level is present and when the output level 'peak's (exceeds -10dBV) for each of the two channels. A further LED indicates the presence of power. The rear panel has locking co-axial socket for the power input and two pairs of gold plated RCA (phono) connectors for the stereo inputs and outputs. There is a screw provided to earth the tone-arm (pick-up arm) if required. Input: -18dBV maximum, 47kohms. Gain: Off to +55dB, 1 kHz. Equalization: RIAA. Response: 20Hz-20kHz +\- 0.75dB, referred to RIAA curve. Distortion: Less than 0.05% THD+N, 20Hz-20kHz, 36dB gain. Noise: Less than -74dB, 36dB gain, 1kHz; less than -80dB, 36dB gain, 1kHz, A-weighted. Crosstalk: Less than -75dB, 1 kHz. Output: -10dBV nominal. Power source: 24V DC, 30mA idle, 45mA maximum. Dimensions: 74 x 76mm (w x d). Mounting size: 1/6 rack width. 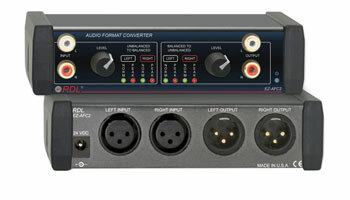 With either four stereo line level inputs or two mono microphone inputs and two stereo line-level inputs, these designs have a stereo mixed output to feed a single stereo line-level input such as a computer sound card or a recorder. Gain controls and level indication are provided. A range of mounting accessories is available for the Radio Design Labs EZ-series. 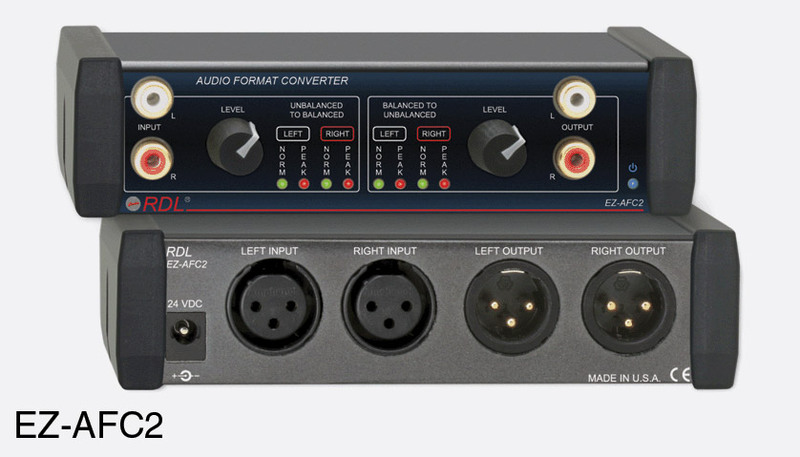 This mixes four stereo line inputs to a stereo output. The front panel has four rotary level controls and two pairs of normal and peak LEDs, one for each output channel. The rear panel has a locking co-axial connector for the power input and both a pair of RCA (phono) connectors and a 3.5mm stereo jack socket for the line outputs. Four pairs of RCA (phono) sockets provide the line inputs. Input four has in addition a 3.5mm stereo jack input. Line inputs: -10dBV nominal, +20 dBV maximum, 10 kohms. Level controls: Off to 12dB gain. Outputs: -10dBV nominal, +16dBV maximum. Response: 10Hz-20kHz +/-10.01 dB. Distortion: Better than 0.05% THD+N. Crosstalk: Better than -72dB, 1kHz. Noise: -85dB referred to -10dBV output. Power source: 24V DC, 30mA idle, 60mA maximum. Dimensions: 146 x 76mm (w x d). Mounting size: 1/3 rack width. Included accessories: AC power adapter with interchangeable AC supply contact-pin assembles. Both UK and EU assemblies are included. This mixes two stereo line inputs and two balanced mono microphone inputs to a stereo output. The front panel has four rotary level controls and two pairs of normal and peak LEDs, one for each output channel. The rear panel has a locking co-axial connector for the power input and a pair of RCA (phono) connectors for the line outputs. Two pairs of RCA (phono) sockets provide the line inputs, input four has in addition a 3.5mm stereo jack input. Two female XLR connectors provide the microphone inputs, which are fed permanently with 24V phantom power. Microphone inputs: -11dBu maximum, 1.2 kohms. Line inputs: -10dBV nominal, +20 dBV maximum, 10 kohms. Level controls: Off to 50 dB gain, microphone; off to 12 dB gain, line. Outputs: -10dBV nominal, +16dBV maximum. Response: 80Hz-40kHz +\-1 dB, -6 dB at 20 Hz with integral high-pass filter, microphone input; 10Hz-20kHz +\-0.01dB, line input. Distortion: Better than 0.1% THD+N, 20Hz-20 kHz, -50dBu, microphone input; 0.05%, 20Hz-20kHz, line input. Noise: -65dB referred to -10dBV output, -50dBu microphone input), -75 dB, -10dBV output, line input. Crosstalk: Better than -72 dB, 1kHz. CMRR: -55dB, 20Hz-20kHz, microphone input. Phantom power: 24V DC, to IEC 1938: 1996-12. Power source: 24V DC, 50mA idle, 80mA maximum, 100 mA maximum with phantom power. Dimensions: 146 x 76mm (w x d). Mounting size: 1/3 rack width. With a single balanced microphone input, two stereo line-level inputs and stereo loudspeaker output, these compact designs offer sufficient power to suit applications in smaller venues. A range of mounting accessories is available for the Radio Design Labs EZ-series. The front panel has three rotary level controls and two knobs offering bass and treble 'tone control'. LED indicators show when power is connected and when the overload protection is active. The rear panel has a locking co-axial connector for the power inlet, two pairs of sprung wire terminals for left and right loudspeaker outputs and a switch to select either 8 ohm or 4 ohms speaker impedance. A 3-pole female XLR connector, with an adjacent switch to enable 24V phantom power, provides the microphone input. Two pairs of RCA (phono) sockets provide the stereo line inputs. Microphone input: -55dBu minimum, for 10W out, -11 dBu maximum, 1.2kohms. Line inputs: -10dBV nominal, -13dBV minimum, for 10W out, +22dBV maximum. 10 kohms. Gain: Off to 74dB, microphone; off to 32dB, line. Equalisation: +\-10dB, 10kHz; +\-9dB, 80Hz. Response: 50Hz-20kHz +\-1.5dB, 10W, microphone input; 35Hz-20kHz +\-1.5dB, 10W, line input. Distortion: Less than 0.25% THD+N. Noise: -70dB referred to 10W, -10dBV, line input; -65 dB, 10W, -50dBu, microphone input. Crosstalk: Better than -68 dB, 1kHz, line input. CMRR: -55 dB, microphone. Outputs: 10W RMS, 8 ohms, per channel or 8W RMS, 4 ohms, per channel. Phantom power: 24V DC, to IEC 1938: 1996-12. Power source: 24V DC, 170mA idle, 1000mA maximum. Dimensions: 146 x 76mm (w x d). Mounting size: 1/3 rack width. With a single stereo line-level input and stereo loudspeaker outputs these can be driven from a mixer, pre-amplifier or directly from a recorder or PC sound card. A single volume control on the front panel adjusts level. A range of mounting accessories is available for the Radio Design Labs EZ-series. The front panel has a single rotary level control. LED indicators show when power is connected and when the overload protection is active. The rear panel has a locking co-axial connector for the power inlet, two pairs of sprung wire terminals for left and right loudspeaker outputs and a switch to select either 8 ohm or 4 ohms speaker impedance. Two pairs of RCA (phono) sockets provide the stereo line inputs. A switch selects stereo or mono operation. Line input: -10dBV nominal, -13dBV minimum, for 10W out, +22dBV maximum. 10 kohms. Gain: Off to 32dB. Response: 35Hz-20kHz +\-1.5dB, 10W. Distortion: Less than 0.25% THD+N. Noise: -70dB referred to 10W. Crosstalk: Better than -68 dB. Outputs: 10W RMS, 8 ohms, per channel or 8W RMS, 4 ohms, per channel. Power source: 24V DC, 160mA idle, 1000mA maximum. Dimensions: 146 x 76mm (w x d). Mounting size: 1/3 rack width. 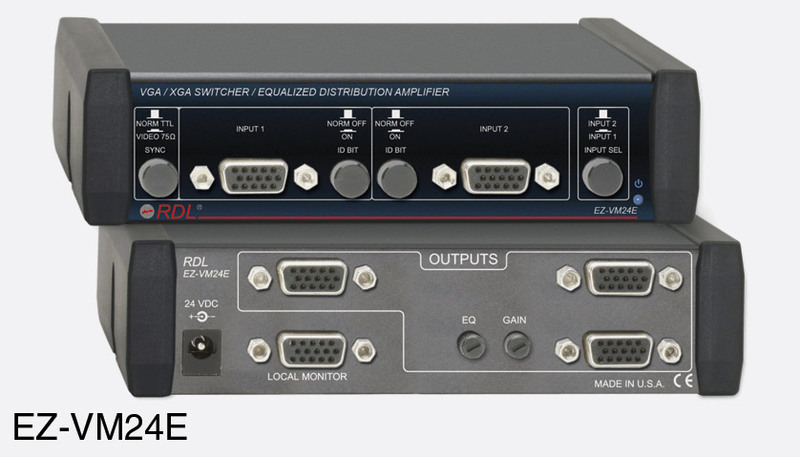 For use when it is necessary to connect one composite video signal to more than one piece of equipment, these are wide bandwidth, compact designs with different I/O connection offerings including RCA (phono), BNC, or HD-sub connectors. Designed for composite signals, the front panels have two trimmers to adjust gain and equalisation. The rear panels have the connections. The power input is a locking co-axial connector. 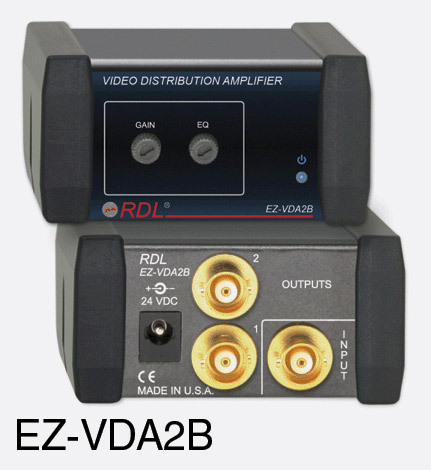 The EZ-VDA2B has three BNC connectors for the input and two outputs. 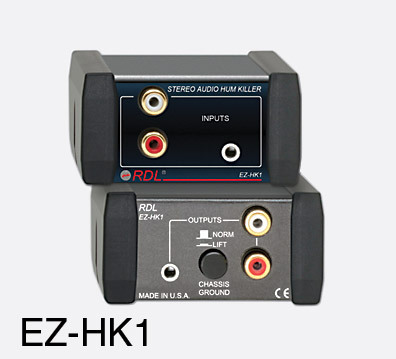 The EZ-VDA2R has three RCA (phono) connectors. The EZ-VDA3B has three outputs; the rear panel has four BNC connectors. Input: 1V p-p nominal, 75 ohms. Gain: Unity to +6dB. Bandwidth: Better than 400MHz. Differential gain: Less than 0.1%. Differential phase: less than 0.1 degree. Equalisation: Flat to +7dB at 50MHz. Noise: Less than -90dB, referenced to 1V p-p. Outputs: 1V p-p nominal, 75 ohms. Power source: 24V DC, 20mA idle, 30mA maximum. Dimensions: 74 x 76mm (w x d). Mounting size: 1/6 rack width. Designed for VGA or XGA signals the front panel of the EZ-VMD2 has an LED to indicate power, a 15-pin HD D-sub connector for the input and two switches. The Sync switch offers a choice between standard TTL or RGBHV 75 ohm video. The second switch offers a choice of connecting the local monitor and input ID bits, or not. On the rear, power is connected through a locking co-axial connector. Two 15-pin, HD D-sub connectors offer separately buffered outputs for the local monitor and the second monitor or projector. Input: VGA to QXGA, RGBHV or RGB with combined sync, 75 ohms. Gain: 0dB. Video bandwidth: Better than 470MHz. Sync (HV) input: TTL, 500 ohms or video, 0.7V to 5V p-p, 75 ohms. Sync (HV) output: 5V TTL. Sync (HV) propagation delay: Less than 4nS typical. Sync (HV) rise time: Less than 4 nS typical. Sync (combined): Output follows input. Power source: 24V DC, 50mA idle, 60mA maximum. Dimensions: 146 x 76mm (w x d). Mounting size: 1/3 rack width. Optional accessories: A unit containing an AC supply, EU contact-pin assembly, is also available to special order. A range of mounting options is available, including free-standing case and rack-mounting adapter for multiple units, fixed desktop mounts, under-shelf brackets and through-surface bezels. Please see RDL EZ Series Mounting Accessories. This is similar to the EZ-VMD2, but with four 15-pin, HD D-sub connectors offering separately buffered outputs. Specifications and accessories are the same as the EZ-VMD2, except as follows. Power source: 24V DC, 70mA idle, 90mA maximum. This is similar to the EZ-VMD4, but has in addition two trimmers on the rear panel, offering a gain adjustment of 0dB to +6dB and a peaking equalisation correction of 0 to +8dB at 100MHz. These do not affect the local monitor output, but the three other monitor outputs. Specifications and accessories are the same as the EZ-VMD4. This is similar to the EZ-VMD2, but there is no ID-bit switch. The ID bit is permanently connected between the input and local monitor connectors. Specifications and accessories are the same as the EZ-VMD2, except as follows. Video bandwidth: Better than 360MHz. Power source: 24V DC, 50mA idle, 60mA maximum. This is similar to the EZ-VM12, but has three 15-pin, HD D-sub connectors offering separately buffered outputs. Specifications and accessories are the same as the EZ-VM12, except as follows. Power source: 24V DC, 50mA idle, 65mA maximum. This is similar to the EZ-VM12, but has four 15-pin, HD D-sub connectors offering separately buffered outputs. Specifications and accessories are the same as the EZ-VM12, except as follows. Power source: 24V DC, 50mA idle, 70mA maximum. These include a free-standing case and rack-mounting adapter for multiple units, fixed desktop mounts, under-shelf brackets and through-surface bezels for the Radio Design Labs EZ-series of audio and video equipment. The EZ-Series offers a wide range of stand-alone designs including distribution amplifiers for line level audio, headphones, composite and XGA/XGA video, audio pre-power and mixer amplifiers, AV input selectors and computer video selectors. They are housed in enclosures with the same height, with widths in increments of one sixth of a rack-width, so they may be mounted singly or in multiples in this range of accessory mounts. These may be used to mount an EZ Series product in any flat surface. The bezel serves to hide the edge of the cut-out through the surface; the EZ Series product fastens to the bezel with only two screws. The EZ-SMB1 mounts a 1/6th rack-width item. Dimensions: 104 x 69(w x h). Cut-out: 79 x 44(w x h). The EZ-SMB2 mounts a 1/3rd rack-width item. Dimensions: 178 x 69(w x h). Cut-out: 152 x 44(w x h). The EZ-CC6 is a steel case for free-standing use, which will take EZ Series products up to six increments of 1/6th rack width. The front and rear, as supplied are open. The cover lifts off the base after four screws are removed. The base plate is punched for fasteners to mount active products, storage drawers or filler panels to fill the remaining open space at the front. The rear is left open for cable access. Made from folded steel, in a wedge-shape, the EZ-DC1 is for mounting an EZ-series 1/6th rack width product above a surface, with the front panel at an angle. The chassis covers a cable port in the desk-top and provides space for excess wire. The bottom is open to give a large area for access to the cable port; the top is also open underneath the mounting position for either a 76mm or 127mm deep EZ Series product. The rear is open for cable access. The chassis is fixed to the desk top, the cables are drawn through the cable port and out of the rear of the chassis. The EX Series product is screwed to the chassis then the cables are brought up from below and connected. The EZ-DC2 is the same as the EZ-DC1 except that it mounts a 1/3rd rack-width EZ Series product. These are used to fill in space in the front panel when the EZ-RA6 or EZ-CC6 are not fully occupied with other EZ Series products. They mount to the base with two screws. This is a rack-shelf designed to mount EZ Series products up to six increments of 1/6th rack-width in 1U of a 19 inch rack. The front and rear are open; the base is punched to fix EZ Series active products, storage drawers and filler panels at the front. When mounted in a rack, it is possible to release two screws at the rear, allowing the base-plate to slide forward so that items may be installed without removing the shelf from the rack. These may be used in an EZ-CC6 Component Chassis or EZ-RA6 Rack Adapter to provide useful storage space for adapters and cables, as an alternative to filler panels. The drawer base slides into grooves in the base of the EZ-CC6 or EZ-RA6. The EZ-SD1 takes up 1/6th of a rack width. The EZ-SD2 is 1/3rd rack width.